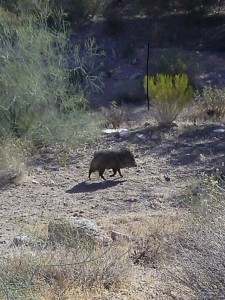 Home » Javelinas stink — well they do. Javelinas stink — well they do. We were taking our morning constitutional with Rose and Kate, our dogs. This time of year it gets hot very quickly in the morning so we try to get out before 7:00 AM. As we were walking Rose stopped and went into hunting mode. Her tail went straight back instead of up. She lowered her head and stared off into the desert. That’s when the odor hit us. There’s nothing like the musky odor of javelinas. It’s a cross between skunk and marigold flowers. Rank to say the least. Javelinas look like wild pigs with tusks. They weigh about 40 pounds. They’re not afraid of people. This photo was taken across the street from a condominium complex.